Host Rob Crandall and friends show you how to go deep for winter steelhead, demonstrating the spey tactics and gear required to be successful with the swung fly in cold water. The video includes the details on fishing a Skagit Line, sink tip, and spey flies in a variety of water types and conditions. Specific instruction is at the heart of this spey fishing production that will help you visualize the skills needed to bring winter steelhead to your fly. The elements of the sink tip, cast, mend, swing, step-down, and even line-slip, are all closely examined. 90 minutes. ABOUT THE EXPERT Rob Crandall is your host in this detailed look at the whys and the ways of spey fishing steelhead in cold water. The ramrod of Water Time Outfitters, he is pushing 25 years of professional guiding on the Northwest s famed steelhead rivers. Spey fishing steelhead is the heart of his business and, next to his family, his primary passion. 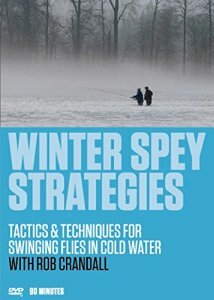 His goal in this angling instructional is to help you understand that cold water steelheading demands different tactic, and to demonstrate what gear and techniques are needed to be successful. Getting your fly down and making a proper swing at depth, in a variety of water types, is the essence of what he hopes you will learn here.